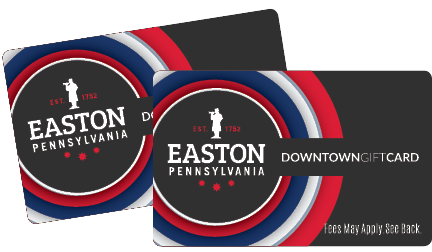 Where can Downtown Easton Gift Cards be purchased? The cards can be purchased in any denomination from $5 to $500. Limited denominations are offered online, but any denomination is available at the kiosk. Yes! Click here to purchase. There is a $2.00 activation fee per card. The gift card is accepted at 50 Downtown Easton businesses. For a complete list of participating merchants, click here. How can I find the available balance on my gift card? Call the number on the back of your card or check www.getmybalance.com. Can I re-load the gift card by putting more money on it? Yes. The customer should inform the cashier how much to deduct from the gift card and how much to deduct from the other payment method(s). Can the gift card be used at an ATM, “Pay at the Pump Gasoline” or gratuities? No. The gift card cannot be used at ATMs, Pay at Pump Gasoline or for tips or gratuities. Can the gift card be used online, for mail orders or phone order purchases? No. The gift card will decline if these types of purchases are attempted.